Karnataka hold the aces in their quarter-final clash against Madhya Pradesh. It would, however, be more appropriate to say that the hosts have handed over the initiative with generosity that is in keeping with the spirit of the holiday season. Despite MP's well-documented resurgence, this fixture was always expected to be a mismatch. Ironically for MP, it has so far proved to be a complete reversal from their Plate League days when a weak bowling attack often left their batsmen with too much to do. In Indore, it was the batsmen who let the team down on the first day; the bowlers put in a big effort on the second, but fielding lapses allowed Karnataka to move ahead, despite being well short of their best. Sanath Kumar, the Karnataka coach, minced no words when asked to describe his side's effort on the second day, when five batsmen perished for scores between 29 and 49. "Absolutely bad batting," was his succinct summation. "We could have easily been 320 for 4. Instead we find ourselves at 306 for 8, since our batsmen kept throwing away their starts. The last five overs [when Jalaj Saxena picked up three cheap wickets] were pathetic." It seemed like a harsh evaluation. After all, his side had pushed the lead to three figures, with two wickets in hand, on a pitch where the bowlers had skittled MP out for 200 on the opening day. "The batsmen were finding it difficult since the ball was not coming on to the bat," he conceded. "But that can be no excuse." Of the lot, only Amit Verma managed to push ahead after getting used to the slow conditions. His stroke-filled 85 was the cornerstone of Karnataka's lead, but it was an innings that underlined the kind of season he has had. He is currently fifth in the run-charts, with six half-centuries - the highest by any batsmen in the tournament - and just one ton. While players like S Badrinath and Wasim Jaffer have ensured their fifties yielded big hundreds, Verma has succumbed to carelessness too often. Sanath was left wondering how much more he could have accomplished with better application. "Amit is not getting the big runs," Sanath said. "Too many 70s and 80s before throwing the wicket away. I have been speaking to him about it, and gave him a piece of my mind today as well. He should keep improving and not settle for half-centuries." Sanath reserved his words of praise for the opposition's bowlers, who showed tremendous heart all day. "To be honest, they bowled really well, and to their fields," he said. "If they had held on to their catches, we would have been in a much worse situation." It was a sentiment shared by Sanath's opposite number, MP coach Mukesh Sahni. "Our bowlers tried very hard, Jalaj Saxena in particular. It has been a bad couple of days for us, and it has nothing to do with the talent in the side. It is just the mental aspect. Kal, bachchon ne bahut zyaada shot khele (Yesterday, the youngsters played too many shots)," he reflected ruefully. "Once the batting fails, it becomes imperative to hold on to the half-chances, but things went wrong right from the first evening [when Mohnish Mishra dropped Robin Uthappa]. "It is, however, crucial to remain positive. We hope to have them chasing a tricky target on the final day. The plan is to get the last two wickets early and then bat positively. There is no need to play too many shots - normal, positive batting will do the trick." 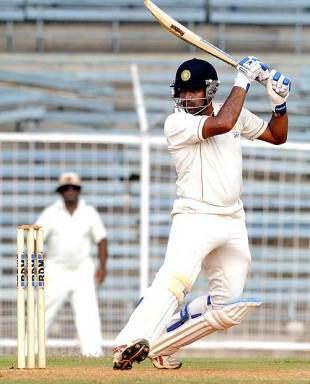 Devendra Bundela, the MP captain, was even more bullish about his side's chances. "The game is 60-40 right now in their favour," he said. "We have nothing to lose and we will give it our best. We will look to restrict the lead to around 120 and bat positively tomorrow. The opening partnership will be crucial. I hope to set a target of around 220 and go for the outright win." His parting shot will leave the Karnataka camp a touch concerned. "It is a knockout game. There will be pressure on the fourth day if you are chasing a target, even if it is not very big," he said. It is a pressure Karnataka know only too well after their heartbreak in last year's final. It is a situation they won't want to find themselves in, against this spirited MP unit that is eager to make amends for its lapses.